Photo by Evan E. Duran. 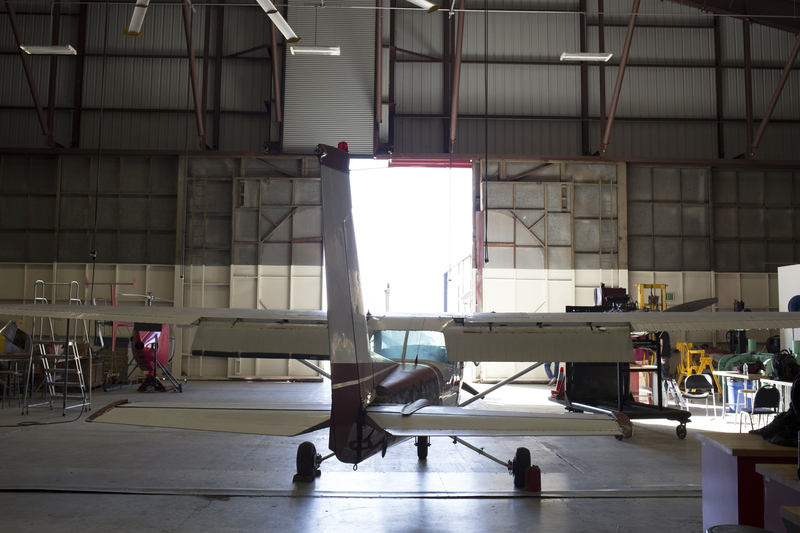 On an unusually warm afternoon in February, students in the City College Aeronautics program trickle into the college’s hangar, located at McClellan Park Airfield — the former McClellan Air Force base — and begin tackling various activities, including rebuilding small plane engines. Later, some students will work with City College’s Boeing 727 Gideon, located at the Sacramento Aerospace Museum, a part of McClellan Park Airfield. As the sun glares down on the airfield, a few students open the hangar door — almost as large as the end of the hangar itself — letting in a large beam of sunlight. Throughout the hangar sit approximately 12 small planes, a helicopter, which is painted burgundy with “City College Aeronautics Dept.” written in white letters on one side, diagnostic equipment and engines varying in size and shape. In the classrooms that line the perimeter of the building, students prepare for upcoming certification testing after punching in for the evening. According to Aeronautics adjunct assistant Professor Dan Madden, the program, which is one of City College’s vocational offerings, requires students to accumulate a set number of hours during their coursework. At the end of the approximately two-year program, students must pass a test — consisting of verbal, written and hands-on components — to become FAA (Federal Aviation Administration)-certified. This, along with the accumulated work experience, verified by the clocked hours, allows students who complete the program to begin working entry-level positions in the field. For students, being able to work on actual planes in a real work-like setting is an invaluable tool. Madden says he has worked for City College for about a year and that it was the donation of a Boeing 727 jet by FedEx on Feb. 22, 2013, that inspired him to pursue teaching. After working on planes as a mechanic for about three years and working as a flight engineer and flying planes for about 16 years, Madden says the birth of his twins made him rethink his career because he wanted to be at home with his children. “I was sitting at home on one of my days off and I saw the news when the 727 [was delivered], and I called up Phil Cypret (the department chair at the time) and I said, ‘Hey, you need an instructor? I’m pretty familiar with the plane,’ and he said, ‘Yeah, come on down,’ ” Madden recalls. According to the Sac City Express, the Boeing 727 is named Gideon after the son of a member of the FedEx Memphis flight crew, as is the tradition for FedEx when it comes to naming its planes. Madden explains that having the plane is great for students, but says it would be nice if the plane was still sitting behind the City College hangar, where it resided after its final flight, so they could start the engines and teach students the process of getting all the systems up and running. He says he’d also like to be able to work on the engines, but because of the high costs of storing the plane, safety concerns and because of things like the high cost of fueling the plane, they are not able to do that. Across from the hangar is another building where later in the evening, students will attend lecture classes and work on book assignments. In the biggest classroom of the hangar, groups and individuals — each in various stages of the program — are busy working on, among other projects, putting engines back together. The room consists of Madden’s class, where students are working on turbine engines, and another advanced class. Being careful not to disturb students as they complete their tasks, Madden explains the purpose of some of the parts sitting on the work benches. Behind the hangar — just outside the large open door — Madden points out a finished version of the same engine his students have been working on, then he leads members of his class down to the Aerospace Museum to take a look inside Gideon. According to City College Advanced Technology division Dean Donnetta Webb, the City College Aeronautics program has a rich history, not only on campus, but in the Sacramento area. 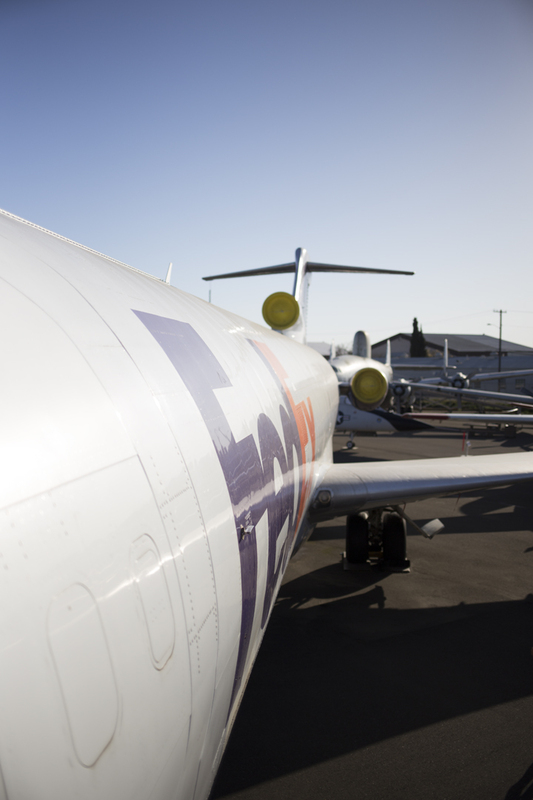 A Boeing 727 donated by FedEx in 2013 to the Sacramento City College aeronautics program is stationed at McClellan Park Airfield. Photo by Evan E. Duran. Webb says the program started in 1932 when aeronautical engineer Hilton F. Lusk — the namesake of the Lusk Center on campus — wanted to teach courses at Sacramento Junior College (the name of City College at the time). The college utilized the Sacramento Executive Airport to train students. Webb explains that during World War II, City College’s aeronautics program was instrumental in working with military bases in the area in training many of the pilots who would fly in the war as well as the men and women who maintained the airplanes. The program also played a big role in the Korean and Vietnam wars. Today, City College’s aeronautics department averages about 130 students per semester, is the only one in the Los Rios district and is one of only 37 college aeronautics programs in the country certified by the FAA to offer air traffic control courses, according to Webb. In fact, Webb says City College is one of only two colleges in California to offer these types of courses. Furthermore, City College is the only school in California to offer dispatcher certificates. Webb also points out that the department offers more than just aeronautics. “We have actually two distinct aspects to our aeronautics department,” Webb explains. She clarifies that the term “aeronautics” refers to airplanes and power plants, meaning mechanical and maintenance. She says students who complete courses in this aspect of the field can work in jobs for airlines as airplane mechanics, but that the training can lend itself to other jobs because it teaches students about electronics, general engine repair, hydraulics and more. “In the aviation side, which has to do with anything having to do with actual flight rather than the maintenance, we have our flight simulators [at McClellan]” says Webb. Since the aviation program at City College is designed as a vocational program, Webb says, upon completion, students can jump right into a career in their field. Webb touts the success of the program. Lastly, the department offers flight technology courses, which Webb says include all of the other basics that someone would need to become a pilot, air traffic controller or dispatcher. Ben Bolin and John Stagg work on a turbine engine. Photo by Evan E. Duran. Aeronautics Department Chair Larry Johnson and Professor Scott Miller teach several of these courses. Miller says in addition to traditional lecture and book studies, students in his courses work in a lab where they are able to experience air traffic control radar simulators and aircraft simulators, among other things. Still, Miller says three or four of his courses utilize Gideon on a regular basis. 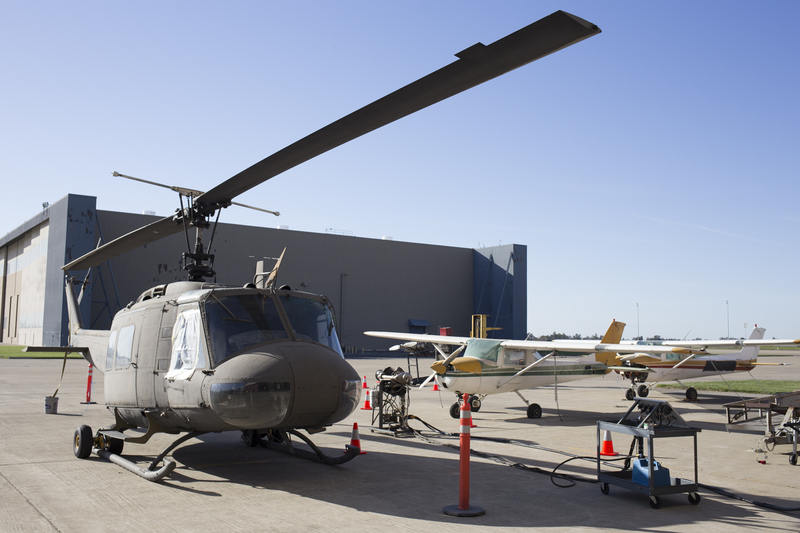 Like any department at City College, aeronautics gets a great deal of equipment and supplies donated or paid for by grants. Webb says that level of support is essential to the program. Sacramento Aerospace Museum. Photo by Evan E. Duran. 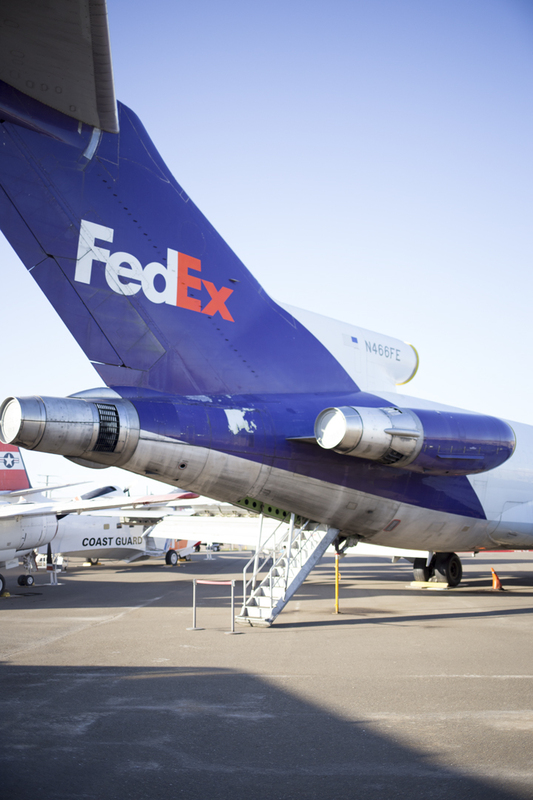 Donations like the FedEx Boeing 727 airplane are certainly a helpful tool for students and instructors in the aeronautics program at City College, but according to Webb, one thing is for sure. It’s the long-lasting impressions that make the efforts of the aeronautics department at City College a success. On what seems like just a tiny slice of the massive McClellan Park Airfield sits the Sacramento Aerospace Museum. The building is surrounded by several planes and helicopters — everything from crop dusters to military air vehicles — and among them sits Gideon. Without a tree in sight, the massive 727 Boeing jet that delivered packages around the world in its previous life is now used for exploration and learning. Not only do the students of City College’s aeronautics program get to enjoy taking a walk through Gideon for the purposes of learning about the airplane, but it also serves as a centerpiece for museum-goers. 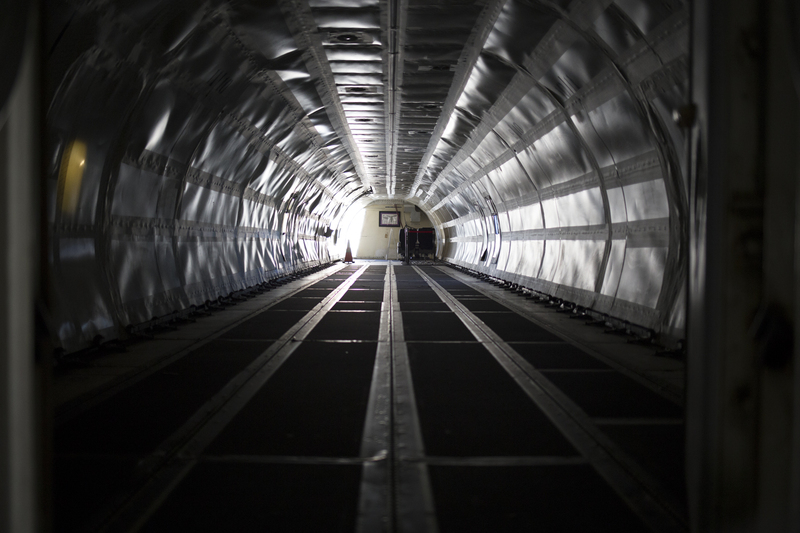 As students walk up into Gideon’s insides — a hollowed-out cargo area, void of seats, that was once used to house large shipments — Madden explains that the orange, cylindrical units to the right are the “black boxes” always talked about after plane crashes. In the flight deck, two students scurry into the pilot and flight engineer seats as Madden sits behind them. He shows the students what many of the gizmos, gadgets and gears do as he explains the process of turning on the hydraulics system. It’s at this moment that having the plane as a learning tool, as opposed to just reading about this information in books, truly comes to life for these students. 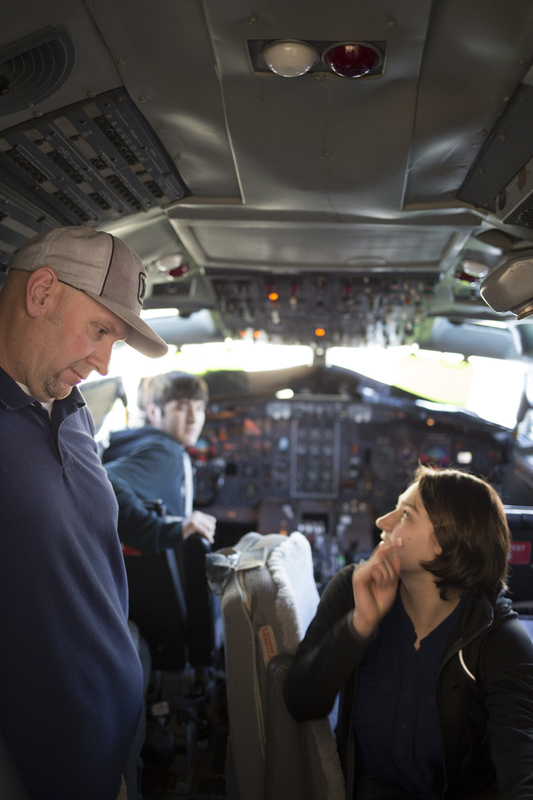 Though the plane is not able to be fully powered up, Madden instructs another student to turn on the jet’s Auxiliary Power Unit, sort of like one would in a car if listening to the radio without turning on the engine. Instructor Dan Madden shows student Teresa Olguin how to start the APU system of the Boeing 727 at McClellan Park Airfield. Photo by Evan E. Duran. For students in the program, having instructors who actually worked in the field and can give real life accounts and information about the various aspects students are learning is an important part of the process. It’s also vital to have learning tools like Gideon. This entry was posted in Features, Mainline and tagged Aeronautics program, airplanes, Boeing 727, Dan Madden, daniel wilson, Donetta Webb, Evan E. Duran, FedEx, mainline, Mainline magazine, McClellan Airforce Base, McClellan Park Airfield, Sacramento City College, SCC, spring 2015. Bookmark the permalink.